Do you know that …Most(probably more than 66%) of the web pages on the Internet have Flash Content.Some have little or some have less flash contents;some of them are totally based on Flash.So if you want to have fun watching videos on YouTube(Although YouTube has planned to use HTML 5,in that case you can enjoy videos without any need of flash player;but at least 5 years is required to implement this plan) or surfing websites on the web,a flash player is needed at the client end i.e browser.So after reading this post you can easily install firefox with a couple of clicks.Adobe Flash player is available for windows,Linux and Mac OSX,Solaris,Windows Mobile,Symbian and Android. 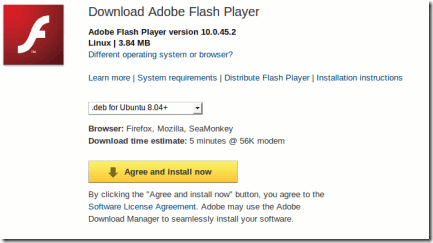 #1 : Download Adobe Flash from it’s official Website(Click on the link given below and select your operating system). #2 : Click on Agree and Install Button to begin the installation procedure.It will hardly take a couple of minutes. #3 : After completion of installation,restart your browser. #4 : That’s all …To verify go to YouTube and play a video. Mozilla Firefox comes with a spell checker for ensuring that you have written all the words correctly in boxes and forms(In feedback or commenting or in post) on any website.Whenever you will write some incorrect word in the form then it will be underlined in red. By default,the Firefox Language is set to United States English which may annoy other users who use other English like United Kingdom English,Australia English or Canada English as their primary language.To solve this problem you can install other Language-pack(includes dictionaries of different languages) and later change the Language settings of your browser to work the spell checker as expected. 3.Now choose your language and click on Install Dictionary to install the selected language pack. 4.Installation will finish within minutes.Then Restart the Firefox. 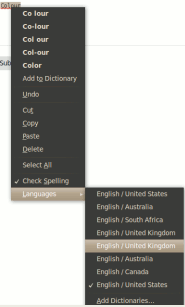 1.Right Click on the word and then click on languages. 2.Now select your language from the list.